Saeed K. Rahimi, PhD, is an associate professor with the Graduate Program in Software at the University of St. Thomas. He is also a cofounder of DWSoft Corporation and InfoSpan, two companies specializing in metadata management for data warehousing. He had been a database design and implementation consultant, providing services to the industry and the federal government for over thirty years. He has spoken in many national and international conferences and has published many scientific articles. Dr. Rahimi holds a BS in electrical engineering and a PhD, both in computer science, from the University of Minnesota. 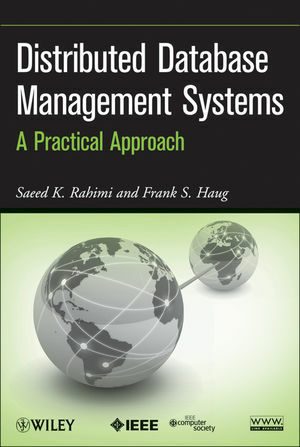 Frank S. Haug is an adjunct professor with the Graduate Programs in Software at the University of St. Thomas, where he has taught graduate courses in software development, distributed database management systems, and data warehousing. He has over twenty-five years of experience in academia and industry, working in areas including software development, database design and implementation, and network administration to implement projects across many technology platforms, DDBMS, and programming languages. Mr. Haug had a BA in mathematics and quantitative methods and computer science, and an MS in software engineering, both from the University of St. Thomas. 1.6 A Reference DDBE Architecture. 1.7 Transaction Management in Distributed Systems. 2.4 Impact of Distribution on User Queries. 2.5 A More Complex Example. 3.4 Distributed Semantic Integrity Control. 3.5 Cost of Semantic Integrity Enforcement. 4.3 Computing Relational Algebra Operators. 4.4 Query Processing in Centralized Systems. 4.5 Query Processing in Distributed Systems. 5.3 Centralized DBE Concurrency Control. 5.4 Concurrency Control in Distributed Database Systems. 6.2 Deadlocks in Centralized Systems. 6.3 Deadlocks in Distributed Systems. 8 Failure and Commit Protocols. 8.2 Undo/Redo and Database Recovery. 8.5 Other Types of Database Recovery. 8.6 Recovery Based on Redo/Undo Processes. 8.7 The Complete Recovery Algorithm. 9 DDBE Security (Bradley S. Rubini). 10.1 Categorizing MLs and DMs. 10.2 The Conceptual Level of the CLP. 10.3 Conceptual Modeling Language Examples. 10.4 Working With Data Models. 10.5 Using Multiple Types of Modeling. 11.2 The Network Data Model. 11.3 The Hierarchical Data Model. 12.1 Applying Our Taxonomy to Traditional DDBE Architectures. 12.2 The MDBS Architecture Classifications. 12.3 Approaches for Developing A DDBE. 12.4 Deployment of DDBE Software. 12.7 Example of Existing Commercial DDBEs. 13.3 Comparing COOP and P2P. 14.3 Distributed Process Platform Requirements. 14.4 Distributed Data Platform Requirements. 14.5 Preview of the DDBE Platforms Used in Chapters 15-9. 15 The JMS Starter Kit. 15.1 Java Message Service Overview. 15.2 JMS Provider Implementation Alternatives. 15.3 JMS Starter Kit (JMS-SKIT) Framework Overview. 15.4 Using the JMS-SKIT Framework. 16.1 Java 2 Enterprise Edition (J2EE) Overview. 16.2 J2EE Support for Distributed Process Platform Requirements. 16.3 J2EE Support for Distributed Data Platform Requirements. 16.4 J2EE Platform Implementation Alternatives. 17 The J2EE Starter Kit. 17.1 Java 2 Enterprise Edition Starter Kit (J2EE-SKIT) Overview. 18 The Microsoft .NET Platform. 18.2 Support for Distributed Process Platform Requirements. 18.3 Distributed Data Platform Requirements. 19 The DNET Starter Kit.